Inspiring a love for language through music is one of my favorite aspects of teaching. Seeing a student's face light up when they love a new beat, hearing students singing the new week's Spanish song together in the hallway, or hearing a soft chorus of students singing the song word-for-word during a song exam is a sign that students have really grasped a love of the song, and in doing so, a love for the language itself. In my third year of teaching, and first year teaching in Baltimore, I found my classroom lacking in the joy and excitement that I hoped my language classroom would have. The first song I taught to my students, "Amor de Mis Amores" by Natalia LaFourcade, revolutionized my classroom. I felt that my students had a new sense of joy and excitement for the day's lesson, that this warm-up procedure (detailed in my next post) was able to bring to the classroom. Teaching language through song is more than just a tool in a teacher's tool box. Music in the target language gives the teacher a chance to connect with a student over a shared interest, and a chance for the student to memorize poetry that they may not have memorized. As mentioned before, song warm-ups bring incredible life to my classroom. In the first five minutes of class, students are energized and re-set to a full immersion classroom experience. The song warm-up procedure is simple, but knowing the pattern of each song's warm-up helps students to feel comfortable in the activity and keeps the warm-up relatively simple. Each day, students begin by writing out the date in the target language. On day one, students begin by listening to the song in its entirety. This gives students a day to analyze the words of the song to see which words they recognize. Escribe 5 palabras que escuchas en la canción. Write five words that you hear in the song. Then students are asked to analyze the tone of the music of the song. ¿Qué es el tono de la canción? Triste? Feliz? Emocionante? Enojado? Amoroso? What is the tone of the song? Sad? Happy? Exciting? Angry, Loving? Finally for Day 1, students are asked to analyze their opinion of the song. ¿Te gusta o no te gusta la canción? Do you like the song or do you dislike the song? On day two, students again listen to the song in its entirety, but this time they read the lyrics of the song (Day 3 - 7) and chose five different words that they understand from the song. This gives students another day to analyze written text of the song to see which words they recognize. Lee el texto. Escribe 5 palabras diferentes que entiendes de la canción. Read the text. Write five words different words that you hear in the song. ¿Qué es el género de la canción? Salsa? Merengué? Pop Cubano? Son? Bachata? What is the genre of the song? Salsa? Merengue? Cuban pop? Son? Bachata? Finally for Day 2, students are asked to analyze the theme of the song. Spanish 1 completes this task in English. En inglés, ¿qué es el tema de la canción? In English, what is the theme of the song? On days three through seven, students again are listening to the song, but this time they are completing a different style of warm-up activity. Students complete a CLOZE listening activity, in which the teacher plays the section of the song for students for the appropriate day, and students fill in the blank spaces with the appropriate word from the song. After they have completed the CLOZE activity and listened to the excerpt twice, I usually give students one minute to translate the stanza themselves. In Spanish 1, students are asked to translate at least two words from each line of the text during this time. In Spanish 2, students are asked to translate as much of the stanza as possible, with the help of a dictionary. 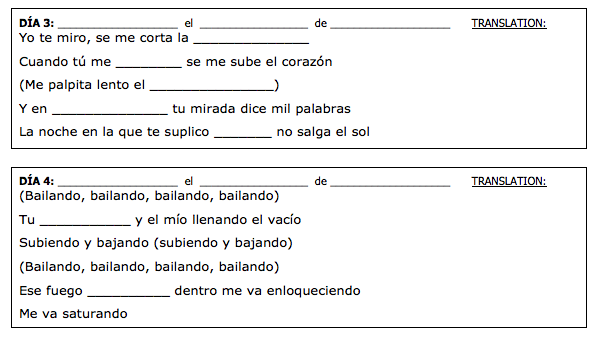 After the three minutes have passed, I ask students (in the target language) for the answers to the blank spaces, and then with student assistance, we translate the stanza together. On day eight, students watch the music video and write three sentences in the target language that describe what they see in the video. Day 9 culminates the song warm-up procedure with a CLOZE activity exam that includes student's ability to analyze the song. Please let me know if you have any questions, and enjoy the light and life this procedure brings to your classroom!